The Georgia Department of Transportation (GDOT) has released research that points to an alarming rise in the deaths of Georgia pedestrians. The number of walkers getting killed by cars has risen 37 percent in the last two years, with 206 pedestrians losing their lives in 2015. This news is disturbing for those who walk on streets that see a lot of traffic. A number of factors can contribute to accidents involving pedestrians, and GDOT has initiated a “See and Be Seen” campaign aimed at reducing these factors and ensuring pedestrian safety. GDOT’s research indicates that a startling 82 percent of deadly pedestrian accidents occur between dusk and dawn. Despite the use of headlights and streetlights, drivers can have a hard time seeing walkers after the sun has gone down. If at all possible, try to avoid walking at night. Pedestrians who have to walk when it is dark out may want to wear light-colored or reflective clothing. Additionally, since 55 percent of accidents happen in areas that are unlighted, walkers may want to carry a flashlight or wear a headlamp. Those driving cars should remember to turn their headlights on at the first sign of dusk. Using high beams in particularly dark areas might help you maintain a good idea of who or what is on the roads with you. Georgia has already banned texting while driving, but there are other things drivers do that can take their attention from the roads. Drivers should avoid talking on the phone, fiddling with the radio, or putting on makeup in their cars, as these tasks take your eyes off the road and can have very dangerous consequences. Make sure to devote all your attention to your driving; it may help keep you and others safe on the roads. Pedestrians should also eliminate distractions while they’re walking. Blasting music on your headphones can drown out the noise of any cars coming your way, and texting is just as distracting for a walker as it is a driver. Use caution when walking and you might be able to avoid disaster. 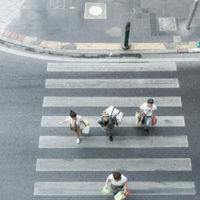 Ninety-three percent of pedestrian fatalities occurred when the walker did not use the crosswalk. This staggering statistic shows just how important it is to use the crosswalk when crossing the street. Crosswalks are easier for drivers to see, and Georgia law requires cars to approach crosswalks with caution and to come to a full stop when pedestrians are using them. If you’re out walking and you decide to ignore the crosswalk and dart in front of traffic, a driver who is not expecting you to run in front of him may have a hard time stopping quickly enough. Drivers, too, need to remember to respect the crosswalks. Slow down when approaching one, because you may not be able to see a pedestrian getting ready to walk. Come to a full stop and allow walkers to cross before driving on. If you practice safe tips like these when you’re out walking, you can ensure that you’re doing everything in your power to stay safe. But sometimes others on the road aren’t so cautious; because of these drivers, horrible accidents can occur. If you or a family member were hit by a car while out walking, you should contact a capable personal injury attorney to face off against the negligent driver in court and get you the damages you need to fully recover. Our attorneys at Gillette Law, P.A. will work tirelessly to fight for justice for your family. Call us today.